Travel New York’s new Hudson Yards: When is a mall not a mall? New York’s new Hudson Yards: When is a mall not a mall? Hudson Yards viewed from the Hudson River. New York isn’t wanting for places to shop, so the opening of a mall seems like something that would elicit no more than a shrug from your average Manhattanite. And yet, on March 14, 14,000 people gathered at the newly opened Hudson Yards complex to be among the first to take in a shiny, well-appointed mall, albeit one at the north end of the High Line where, just a few years ago, there was nothing. Okay, it’s more than just a shopping centre. The one million square feet of retail space include Manhattan’s first Neiman Marcus, as well as several dining options, such as Kawi, a new concept backed by Momofuku’s David Chang (designed by Toronto-based firm DesignAgency), TAK Room from Thomas Keller and José Andrés’s Mercado Little Spain (think a Spanish version of Eataly). Visitors enter 'The Shops' during the grand opening of phase one of the Hudson Yards development on the West Side of Midtown Manhattan on March 15, 2019 in New York City. Also within the mall is Snark Park, the first permanent installation space for the Snarkitecture team, a design practice that blends art with architecture to make both accessible to the masses. The premiere exhibition, running until August, is a series of white pillars, some hollowed out and decorated with Instagram-friendly mirrors (in the vein of a disco ball), faux fur or golf balls. It’s an homage to the pillars of ancient Greece and Rome, and to the modern ones that stood outside for the past decade as this US$25-billion project was built. In front of the mall is The Shed, a new performance arts centre (Bjork’s eight shows this spring are already sold out), and beside it, what will likely be this new neighbourhood’s primary draw, both for tourists and locals: Vessel. 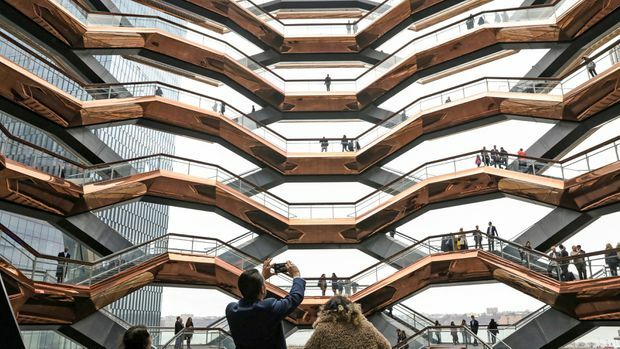 People tour the inside the 'Vessel,' a large public art sculpture made up of 155 flights of stairs, during the grand opening of the The Hudson Yards development. The interactive public art piece is, at its most simple, a series of staircases. Designed by London firm Heatherwick, and inspired by the stepwells of India, Vessel is a honeycomb-like structure, a warm reflective amber on the outside thanks to copper-covered steel, and a hive of activity inside, with 154 concrete staircases winding their way around the structure. One could spend hours walking up and down the almost 2,500 stairs. Stuart Wood, who led the project for Heatherwick, says the team also took inspiration from the promenade-friendly public spaces of Europe, where people meet to walk, and hope that the collective current priority on fitness and wellness will encourage people to interact with the structure. It’s doubtful much encouragement will be needed. From any level, any of the 80 landings, the views are inspiring – even more so when looking inward at the structure itself. Visitors climb the 'Vessel' staircases on the opening day at Hudson Yards. The complex is not yet finished. Joining the retail, dining and experiential spaces will be a massive Equinox gym and the fitness company’s first hotel (opening in June). 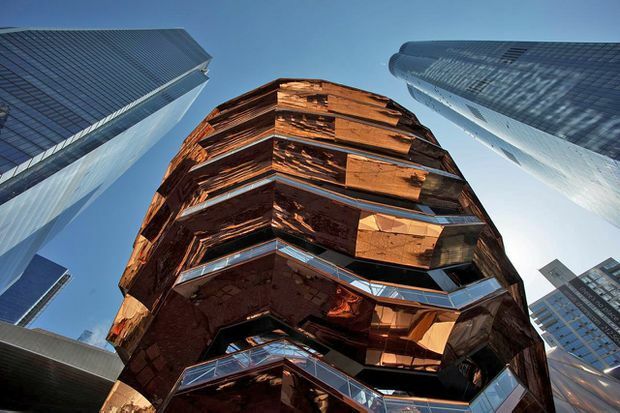 A garden will bloom around Vessel in the main square, and an observation deck will jut out from one of the towers in Hudson Yards (who needs a rooftop patio when you have a balcony 1,100 feet above ground?). View of the public square and gardens looking south from 33rd St. So yes, Hudson Yards is a mall, but it’s also more than that, and it’s the combination that will draw tourists, and perhaps even the most jaded local. This March 5, 2019 photo shows the 'Vessel,' a 150-foot-tall structure of climbable interlocking staircases, that is the center point of the $25 billion Hudson Yards redevelopment in New York. The newly opened Moxy Chelsea is a 20-minute walk from Hudson Yards, Times Square and Union Square. Taking inspiration from its setting in Chelsea’s Flower District, visitors get to the front desk through a mini-sized but mega-fragranced Putnam & Putnam flower shop. Rooms take inspiration from European micro hotels – artfully designed essentials are in every room, but don’t expect more than the essentials. You’re in New York, though, so why are you in your hotel room? And the rooftop bar – on the 35th floor of the hotel, it’s the city’s highest – offers a view of Hudson Yards to one side and the Empire State building on the other. Rooms start around US$159. For more information, visit moxy-hotels.marriott.com. Accommodation was provided by NYC Go. It did not review or approve this article. For more information, visit nycgo.com. The Great Room at 'The Shops' at Hudson Yards.